Rose quite literally kicked off the party with a soccer ball and a game to exercise the minds and bodies of Elders. Spring is a time for renewal in many native communities. 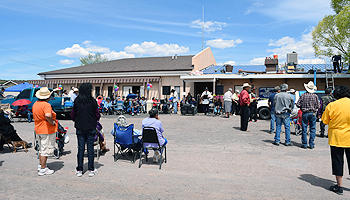 The Lupton Senior Center took it upon themselves to host surrounding senior centers and Elders from these communities. Although Lupton did not partake in the standard food service, they participated in other services. This event accommodated other Program Partners for a common cause — honoring Elders and the Older Americans Act (OAA). The party moved outdoors to enjoy the spring sunshine, food, and friendship. The Lupton Chapter House, just west of the New Mexico border on the Arizona side of the Navajo Nation, is supervised by Rose Silversmith. We were invited to join the gala. Chapter and senior center vans began pulling in for the festivities early, shades were being set up by a small number of vendors to sell their handmade crafts, and a PA system/DJ booth was set up for music and dance in the parking lot. As the group gathered in the large great room, an Elder led the opening prayer. Rose quite literally kicked off the party with a soccer ball and a game to exercise the minds and bodies of Elders. 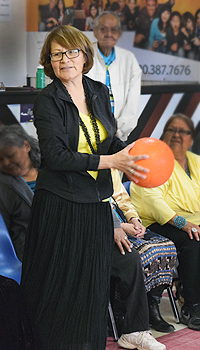 Two soccer balls were passed to two Elders designating separate teams. The game began with the participants passing the ball like a hot potato and opposing sides worked to reach the beginning point first. Elders cheered each other on to beat the other team, as applause and laughter filled the room. 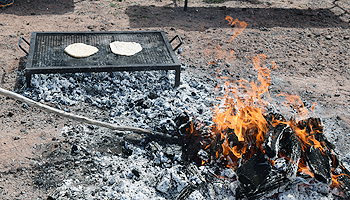 Fresh tortillas were rolled, patted, stretched, and placed on an open fire. The party moved outdoors to enjoy the spring sunshine, food, and friendship. Fresh tortillas were rolled, patted, stretched, and placed on an open fire. The master of ceremonies began taking requests. Elders didn’t waste any time picking a partner, and proceeding to swing and sway to the music. For elderly nutrition centers, the focus is on more than nutrition. It is a holistic wellness that also goes beyond healthy eating habits. It really is so much more. Lupton clearly showed others how to honor those individuals in the community who hold their language, culture, traditions, and stories.